New Horizons remains healthy and on course for its prime Pluto system science in July! As I write these words I am flying to a dress-rehearsal simulation (called a “sim”) of the closest approach portion of the Pluto flyby. About 40 science team members are involved—atmospheric scientists, geologists, geochemists, planetary astronomers and space physics experts. This is the second of three such multiday sims that the science team is doing to prepare for the flyby in July. But this is far from the only type of flyby simulation we’re doing across the project. There are also sims to practice optical navigation to home in on Pluto, sims to practice searching for hazards on approach, sims to handle possible instrument and spacecraft anomalies, and more. Some sims only involve a handful of people, some (like the one I’m headed to) are much larger; but all involve practice datasets that scientists and engineers retrieve, reduce and analyze as a part of the practice. In total, several dozen mission sims have already been completed over the past few years. Now that we’re on early approach, we have just a few left. Hard to believe, but we’re almost finished training for encounter operations! Right now, just as when I wrote in January, the SWAP, PEPSSI and SDC instruments are taking daily science data—measuring the charged particle and dust environment of space near Pluto’s orbit. And now, the LORRI long-focal-length camera aboard New Horizons has started imaging the Pluto system for navigation purposes. This has yielded a few dozen images of Pluto and Charon — which still remain just dots in the distance — against star fields. Despite the low-resolution imagery of Pluto and Charon when we are still so far out (well over 100 million miles), these images help us triangulate the distance to our targets more accurately than any other navigation technique we have. Of course, the images are getting better as we get closer, and by April, they will begin to reveal Pluto as a tiny globe a few pixels across, rotating in the far distance, by then just 70 million miles or so away. Last month, I wrote about the Pluto atmospheric science we plan to do during the flyby, and promised that this month I’d preview the surface geology, geophysics and composition measurements we’re planning. But before I tell you what we’ll be doing to explore these aspects of the Pluto system, I want to tell you the basics of what we know about Pluto’s surface geology and composition, and what we know about Charon’s too. Unfortunately, it isn’t much. We know that Pluto’s surface is, on average, extremely reflective, like freshly driven snow. We also know that surface has very large markings with greatly varying reflectivities and various shades of red to neutral color. We know the surface ices are dominated by molecular nitrogen, and that hydrocarbons like methane and ethane are present, as is carbon monoxide ice. We also know that the proportions of all of these ices vary as Pluto rotates and shows us different terrains. We don’t know much else, because we can’t see enough detail from Earth to determine the planet’s geology, how cratered it is, or any signs of ongoing geophysical or geologic activity. That has to wait for New Horizons in July. We know even less about Charon. Its surface is about half as reflective as Pluto’s, but still reflective enough to be indicative of ices, as opposed to dark soils like on the Moon and Mars. We know that Charon’s surface is not tinged red like Pluto, but is neutrally colored. And we know that Charon is covered primarily in water ice, with hints of ammonium hydrates laced into the surface. Like Pluto, our current lack of spatial resolution prevents us from knowing much more. Even the best images of Pluto, made by the Hubble Space Telescope, are too crude to reveal geologic details, because they can only put few pixels across the planet. Compare a Hubble image of Pluto (left) to an artificially blurred image of Earth at the same pixilation, and you’ll see how little we know! Frustrating as our lack of knowledge about Pluto and Charon is, it’s all about to change, beginning in just a few months when New Horizons becomes close enough to start seeing new details. Mapping the surfaces of Pluto and Charon, including in color. Mapping the distribution of major ices and minerals on their surfaces, and searching for minor constituents too. Mapping the temperatures of the major ices across their surfaces. Stereo mapping to determine the 3-D topography across large swaths of both bodies. 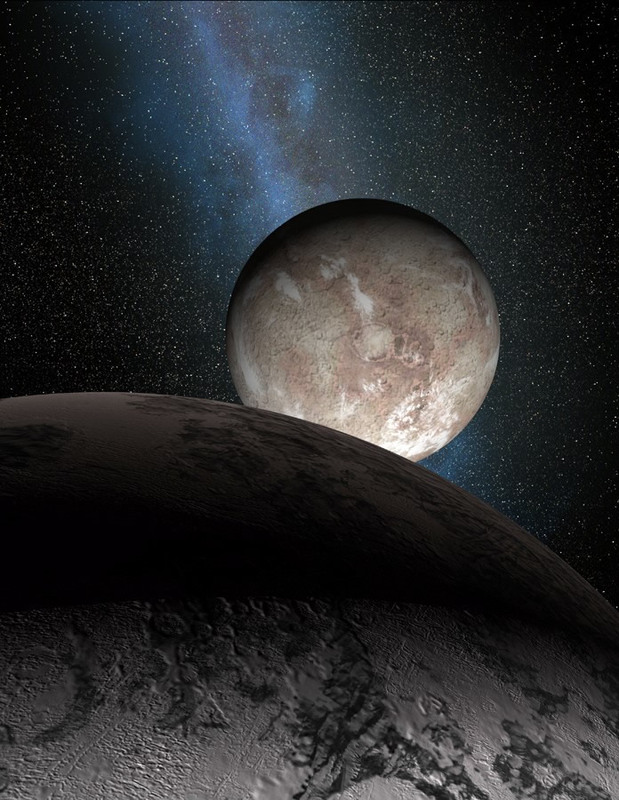 Determining the shapes of Pluto and Charon to exquisite accuracy as a clue to whether one or both have internal oceans, or solid cores or both. Better determining the radii, masses and densities of both bodies. Determining the number of craters across different portions of both bodies as a guide to the relative ages of the different surface units. By the way, we’ll attempt to achieve many of these objectives on Pluto’s smaller moons too, though some are not well positioned at flyby (given their tiny sizes) for as detailed a look as we’ll have at Pluto and Charon. Ralph is our primary mapper; it will obtain black and white, color, and composition maps of Pluto and its moons. These will be used to address virtually all of the objectives listed above. In fact, some of the spectral bands Ralph will map across these bodies will even let us indirectly map surface temperature variations from place to place and overlay those on color, composition and geologic maps. LORRI is our high-resolution imager; although it doesn’t have many of Ralph’s sophisticated color and composition mapping capabilities, it has about five times the magnification and therefore about five times the resolution on the surface that Ralph offers. We’ll use it to map Pluto and its moons, to determine the granular properties of their surfaces (by observing how their brightness varies from place to place at many different angles), and to give us high-resolution shape profiles. LORRI’s best images will have resolutions just a little better than 100 meters per pixel on both Pluto and Charon — something unprecedented in a first planetary flyby. And LORRI imaging of each object taken at different points along the flyby trajectory when we are close will let us make stereo maps to reconstruct 3-D topography. This table summarizes the approximate best resolution New Horizons will obtain on each body in the Pluto system for various types of imaging. Panchromatic Imaging means black and white. Here are just a few ways to follow news and commentary on New Horizons on social media! You can find more by searching on the Web or visiting the links below. REX, our radio science experiment, will better determine the diameters of Pluto and Charon through radio-occultation experiments. It’ll also yield better masses for the two bodies by tracking (with radio, of course) how our trajectory changes as we fly by. And it will directly measure surface temperatures in a special mode called radiometry. As you can see, we have in our arsenal a wide variety of ways to reveal the surface geologies, compositions, and internal geophysics of both Pluto and Charon and Pluto’s smaller moons. The fun begins in late May, intensifying across June and then July. So stay tuned: As I said last month, soon I won’t have to write about plans because I’ll be able to tell you about results. Well, that’s it for now, I’ll write again in about a month. Until then, I hope you’ll keep exploring—just as we do.